Just picked this up for $ 70 and it's a 50# leftie.This was one of the bows I could not afford back in the day.I had to settle on buying a York tracker.These were in the same price range a Howetts or a Bear.Pearsons were mid price.Only had a few shots from it and it feels fast for what it is .Who has one and what's your opinion of it? 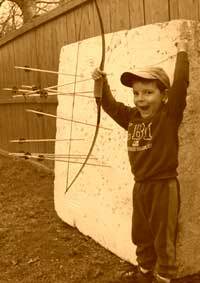 I don't have one but the man that owned the old Archery World store in Austin, Texas years ago had one that he used to let me shoot when I was in the store. I was riding horses and working cows then and couldn't afford one either. Personally. I though ti was a great bow. I could should it really well and it as as fast as about any custom bow that anybody brough in. I had a Hoyt Pro Hunter about 2 years ago. Nice shooting bow you want be disappointed. Especially at that price , that was a steel ! The one I had I sold on here in the classifieds for $275 shipped. Great find ! Here's one of mine...bit older than yours. And here's another one...it is a Whiffen Comet but it's actually a Pro-Hunter made for Whiffen by Hoyt. I kept it in my collection when I couldn't sell it for a mere $145 shipped because it did not have the Hoyt name on it! If it looks familiar it's the same model pictured in Fred Bear's Archer's Bible. A Hoyt Pro-Hunter was my first "real" bow. I got it in 1968 and began my bowhunting life with it. I still have it and my daughter shoots it now. A family heirloom! And the specs on the Whiffen...dead give-away,along with the tips. I remember shooting one G.D. Stout had in his side yard. It was a 45 pounder but shot like a 55 pounder. It was smooth pulling with pre load at front of draw. Id like to aquire one for my collection. There a true hunting bow in my own opinion. Your impression was dead on Scott. Both of mine hit like a hammer! My service unfortunately dropped out.Its been like that for about a week on and off.100 meters up the road I can get service but not at home.I am going to. Try again. I love the story about how when Fred Bear introduced the original Kodiak Hunter as a 58" bow, Earl Hoyt took him to lunch and gently pointed out that it sure looked a lot like the 58'. medium-wristed Hoyt Hunter that had already been on the market for some time. The Kodiak Hunter changed to a 60" bow the following year. I have a LH Hoyt Pro that looks nothing like those posted above. It is 66" and 49lbs. I'm assuming mine is an older model and that Hoyt added the "Hunter" later. Is that correct? OSR...believe that bow was made around 1969-1970...still figuring out Hoyt's.